Think about your favorite authors—the ones whose books deeply affected your life. Do you know what all of them had in common? None of them used special book writing software to write their book. Yet, this is where many beginning and amateur writers start. They spend so much time searching for the “perfect” book writing software (among other tools) that will magically make their writing better. Let me spare you time and money: software is not a relevant consideration for writing a great book. That’s not to say writing software will never be relevant. It could happen. But after testing and trying all of them, I have yet to find software that helps write a book. I’ve been writing professionally for 15 years and wrote four New York Times Best Sellers with basic software. The same is true for almost every other writer I know. If you’re stuck on finding the “perfect” software, something else is holding you back. We all know this person: he decided to start golfing (or CrossFit, or MMA, or yoga or knitting, doesn’t matter), and then spent weeks researching the perfect gear. Then he spent way too much money on it, showed it off to all his friends, took a few cool Instagram pics…and then never actually used the equipment. People who obsess over tools are usually scared of the work. For most people who obsess over writing software, it’s a way of hiding from the actual writing. It’s understandable—writing a book can bring up a lot of fears. I say this not as a judgment, but as a person who has done this exact thing many, many times in other areas of my life. After all, it’s fun to shop for equipment and to fantasize about success. And taking pictures is such an easy way to get the attention benefit of hard work without having to suffer through the actual hard work. But the only way to actually accomplish anything is through doing the hard work…and that is scary. Again, I say that without judgment. I have been the author afraid to write a book and using a distraction to avoid this fear many times. And I have seen many authors afraid to write a book, for any number of reasons (that usually boils down to the fear it will make them look stupid), so they install a writing assistant but never write a page. I wrote an in-depth blog post that details about the 6 book writing fears and how to beat them. But again, knowing you are afraid, and connecting that fear to your endless search for something to distract you, is not an easy thing to do. If you are looking for book writing software, I would highly recommend you ask yourself that question: is this search necessary, or am I distracting myself from my fear? Now—all of this being said, there are very valid reasons to want to find and use good tools to help you make the writing process easier. To that end, here is my evaluation of some of the more common tools. Every word processor is essentially the same. You should use the one you like best. I like Google Docs because it’s simple to use and makes collaboration very easy. You might like Microsoft Word or Pages best. That’s totally fine. I can promise you though, there is no “right” choice here. The key is familiarity and comfort. Writing a book is hard work—you don’t want clunky software slowing you down, so go with what you know and with what feels right to you. Every word processor will check your spelling and grammar for basic mistakes. What spell check won’t help you do is make your writing short, simple, and direct. If you would like help with that, check out Grammarly, a free writing assistant that integrates with Google Docs and Microsoft Word. If you have a Mac, you can download the desktop app, and it will integrate to most everything you use to write. There are paid plans available, but the free version is enough for writing a book. I tried Grammarly for a while and found it clunky, but many excellent writers I know love it. Test it and see if you’d like. 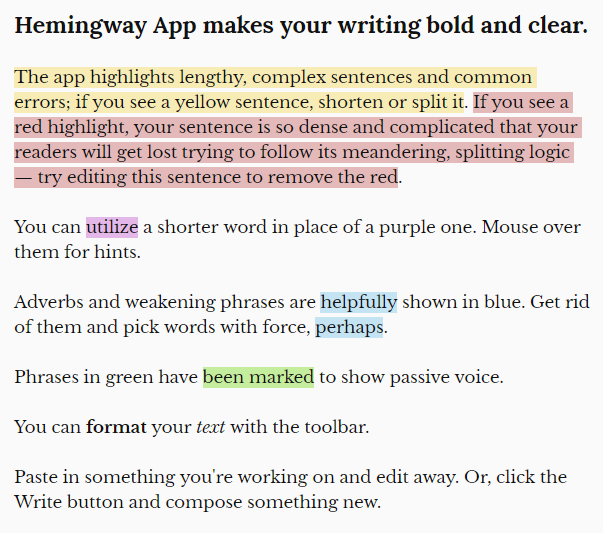 An alternative writing assistant is Hemingway Editor. You can copy + paste your writing into their online editor or download the desktop app. Some writers love Hemingway Editor, some don’t. I kinda like it, but don’t use it. It’s helpful for sentence structure and common problem areas: passive voice, excessive adverbs, and poor word choice. One unique feature of this software is that it assigns a readability grade level as you write. This doesn’t necessarily reflect your target audience, but the grade level needed to understand your prose. Hemingway’s work, while written for adults, scored as 5th grade. Seems bad? Wrong. That’s great. The more simple and direct your writing, the better it is. If, like most people, you struggle with overwriting, this might be a tool you like. Honestly, I think distraction-free programs are pretty dumb. If you block websites on your computer while you write, you can always pick up your phone and check Instagram. 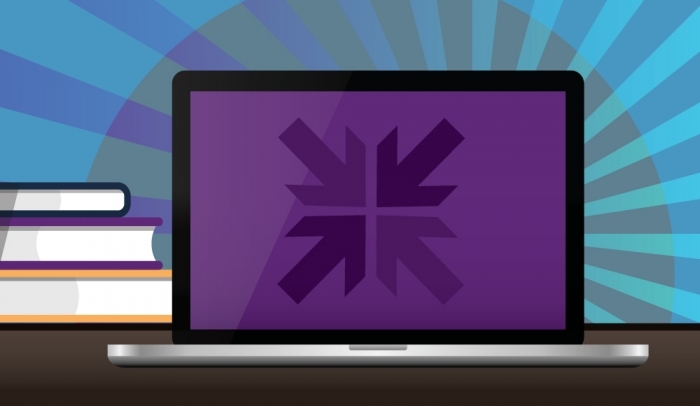 Options like Freedom that sync across your devices have a monthly fee. That said, if you know you’re prone to distraction, a program like WasteNoTime or FocalFilter might be worth a try. If it helps you stay focused and write, by all means, use it! It’s what you need to do, instead of spending time worrying about what is the best writing software to use. This is the guide you need. Download for free and get started today.